The month of June was incredibly hectic for me. My job decided it wanted to try and take over my life and then my daughter, Celeste, decided she wanted to enter the world. Only one of the those events was a priority in my life and it definitely wasn’t my job. 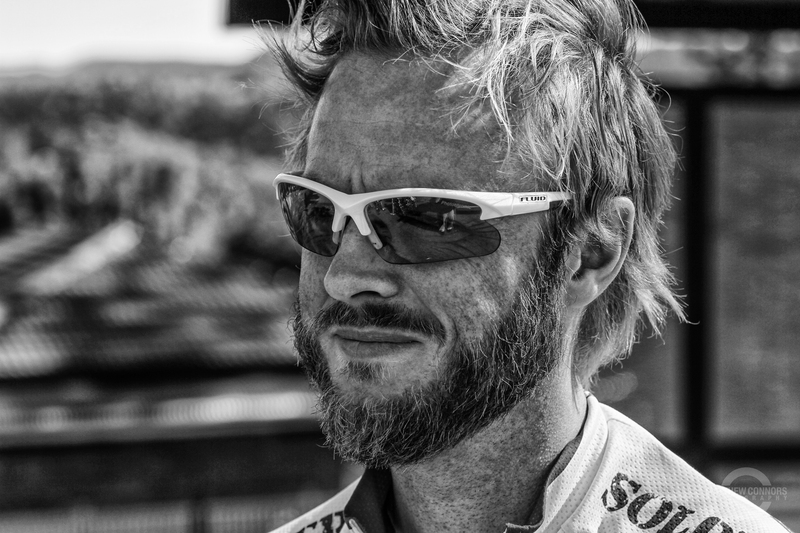 My training as a result suffered and I barely managed to get a handful of short rides under my tyres before our second Team Soldier On training camp came around. 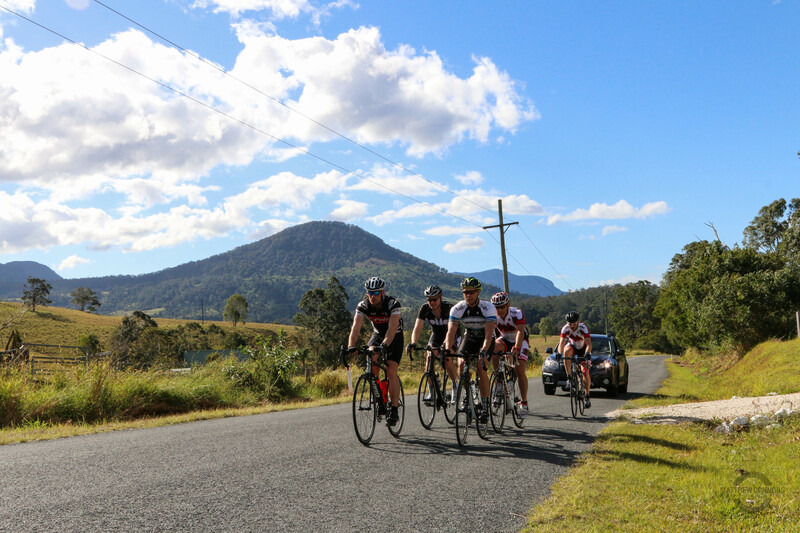 The second training camp was based out of Kingscliff, just south of Tweed Heads near the NSW/QLD border over the weekend of 28-29 June 2014 . 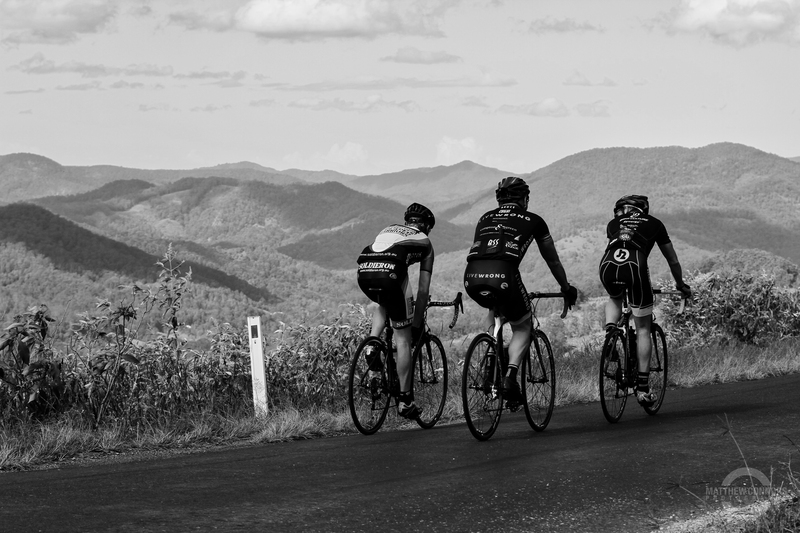 The plan was simple; coach Scott Sunderland was going to make us climb some hills and ride some big kilometres akin to what we will be facing in France for the Trois Etapes. I don’t enjoy flying and certainly don’t enjoy flying with an expensive bicycle packed inside an expensive bike bag that screams “stack as much heavy crap on me as possible”. 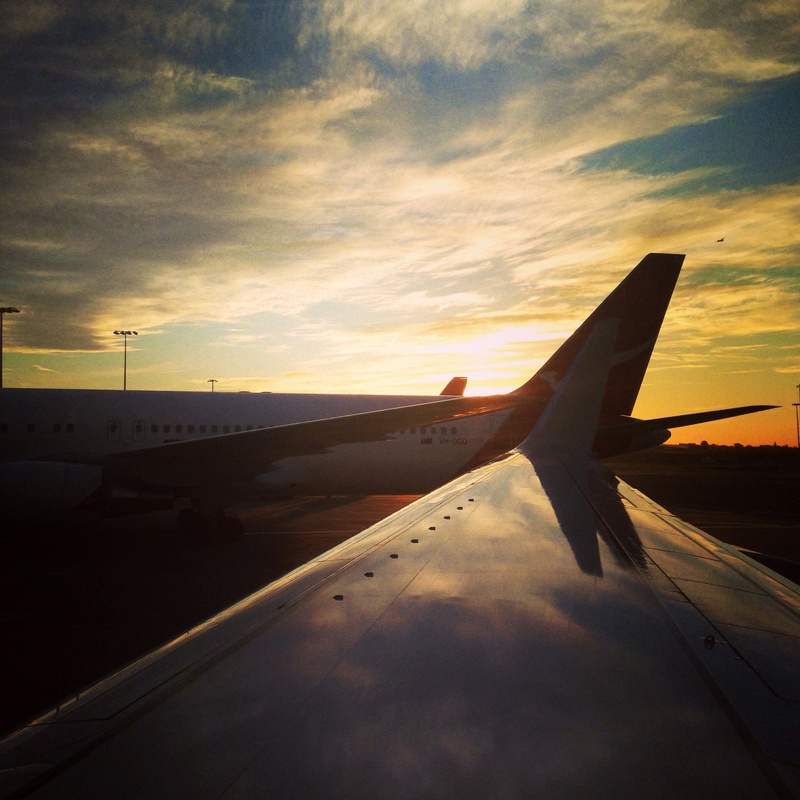 While the flights to Coolangatta went off without a hitch (top effort QANTAS) – the flights home came very close to being labelled a cluster-f**k (thanks VIRGIN Australia) complete with delayed/cancelled flights and high-end bicycles being sent to the wrong state and being ignored by the Virgin airport staff! After arriving at the Peppers Salt Resort & Spa at Kingscliff we headed off to the local restaurant strip for dinner before heading back to our rooms to ready our bikes for the next day’s riding.
.:Bikes ‘carefully’ stacked in the van for the first day of riding:. 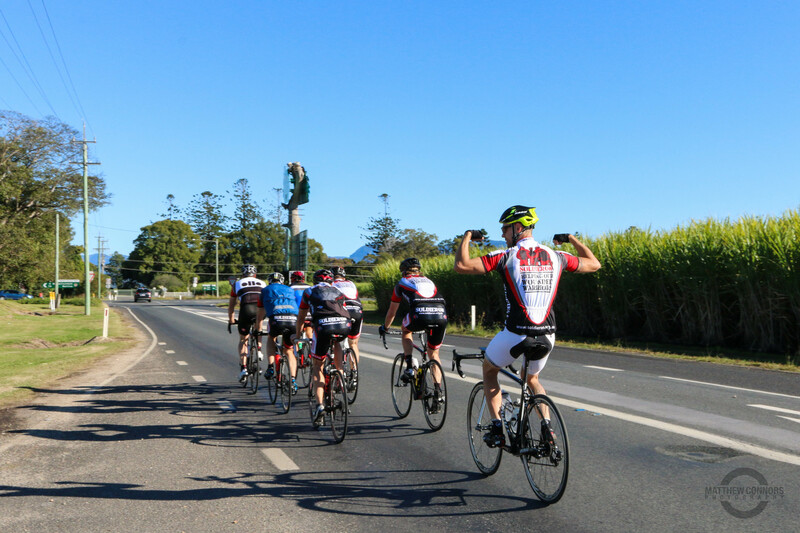 On Saturday we set off about 20 minutes out of Kingscliff with coach Scott following us in the support vehicle and photog Matt zooming past us in the search for optimal photo locations. The ride started easily enough with a few short climbs before suddenly becoming a decent 8km climb followed by some very sketchy (for me) descents. I was definitely in the red zone early on in the ride and was finding it very hard to regulate my breathing and lower my heart-rate. 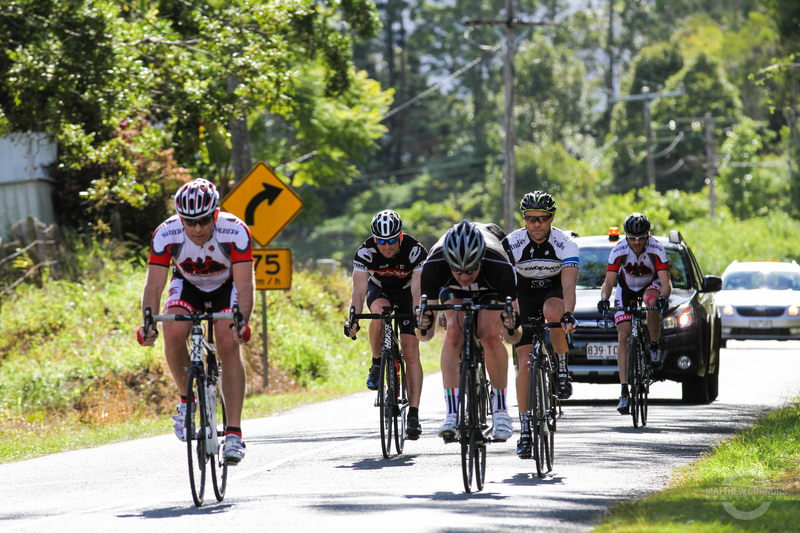 The months of training was certainly evident in the other guys, but as the ride progressed I knew I wasn’t keeping up. Some more sketchy decents saw our driver Bruce (this time on a bike) overshoot a corner and meet the bushland up and close. 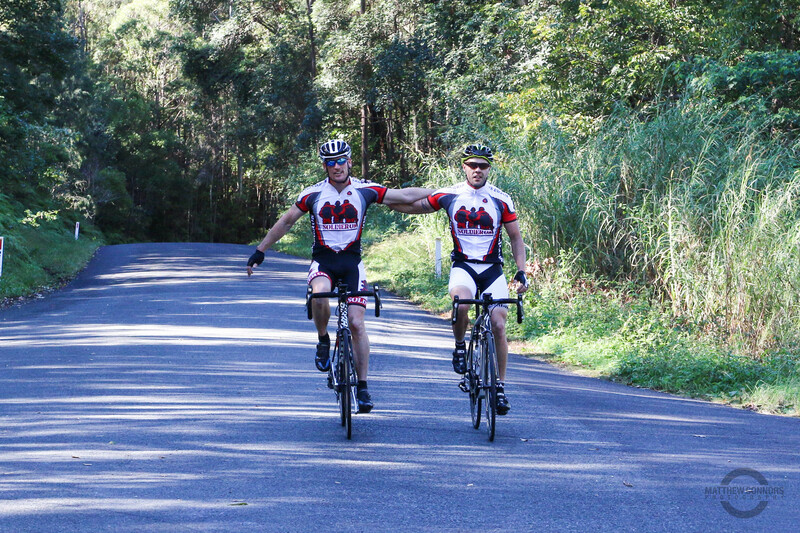 As the day was drawing to a close and we were heading back to Kingscliff, I was steadily dropping off the pace and eventually pulled over and jumped in the SAG wagon with Matt.
.:My bike having a lay down, just like I wanted to do:. 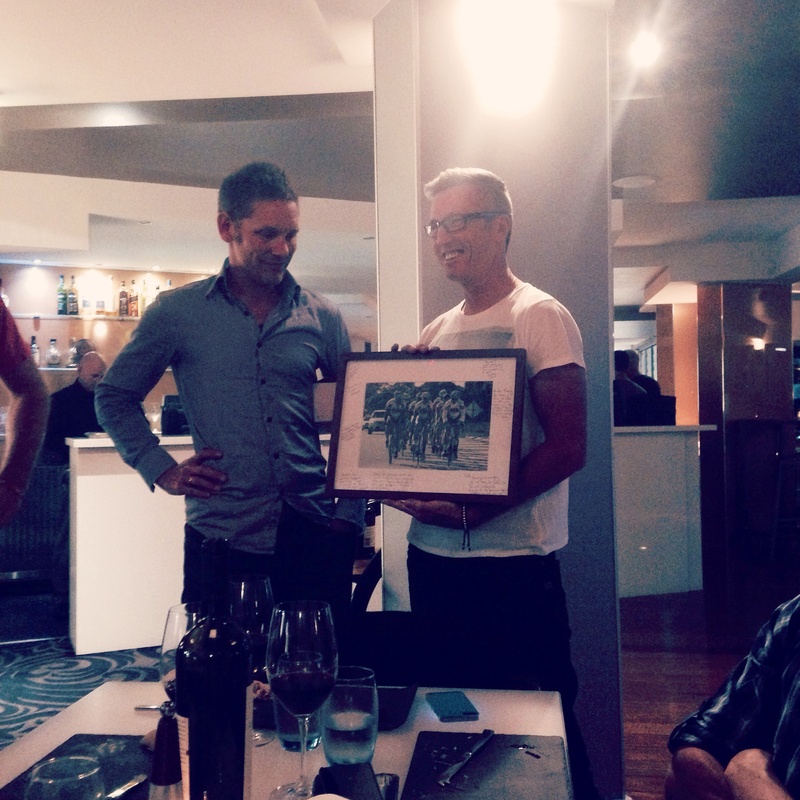 The evening culminated with a group dinner and short presentation to coach Scott.
.:Thank you Scott Sunderland – cyclist/coach/ball buster:. 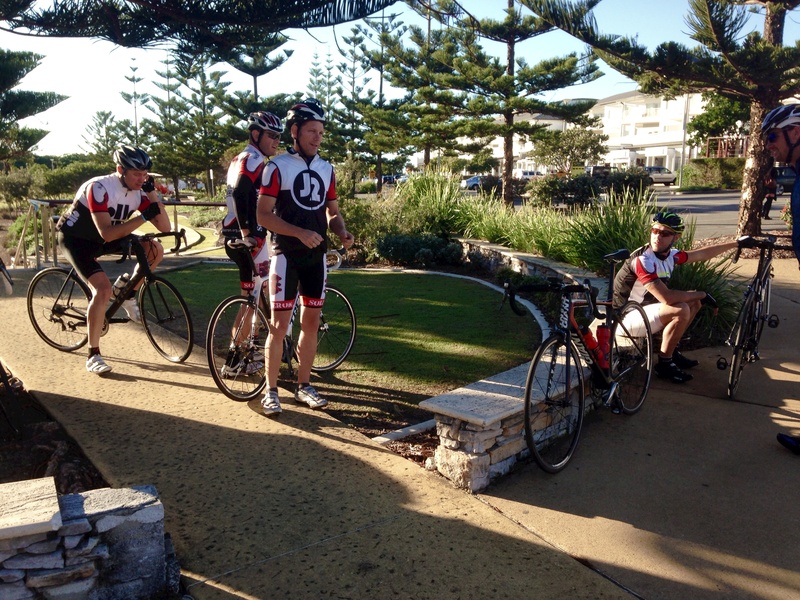 Sunday saw us step off from the hotel nice and early for a brisk ride before tackling some more climbs. 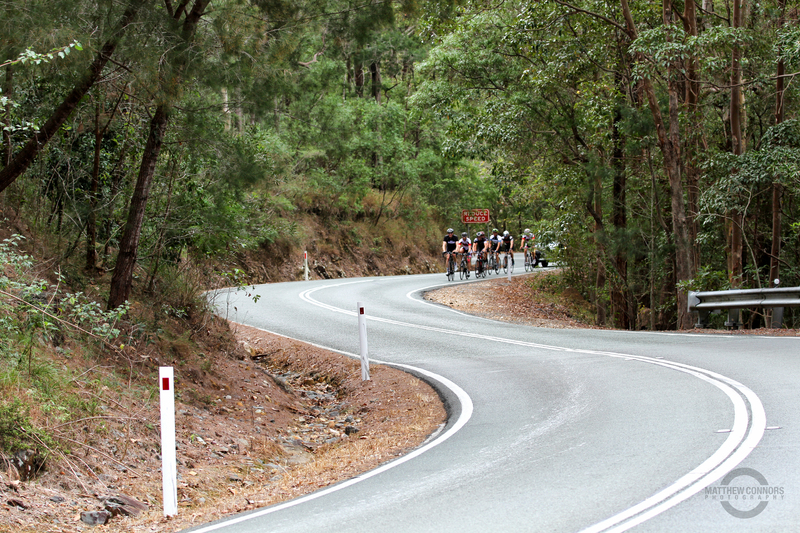 I pulled up reasonably well from the day before and was looking forward to some more riding. The morning air was cool and very nice to ride in. 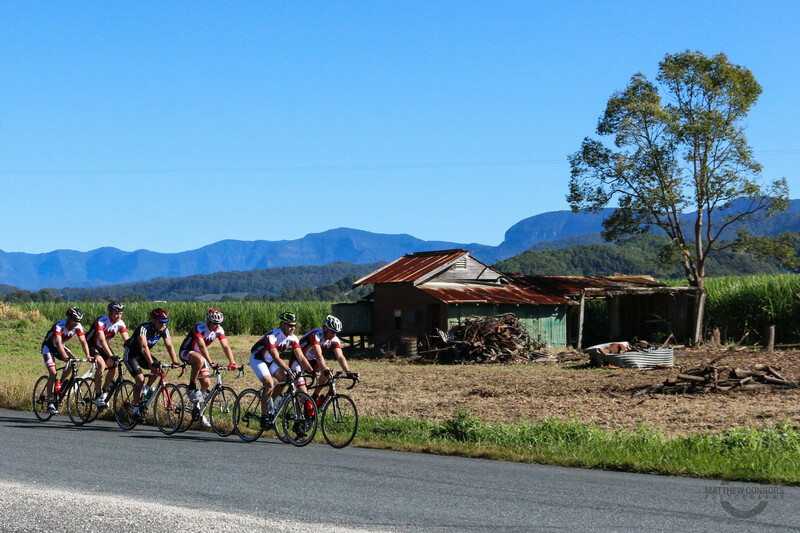 We eased into our first 20km at a nice quick pace with all riders taking turns at the front. At around the 35km mark I knew I was in trouble. In just two short days I had ridden further and harder than I had in the past three weeks. My troublesome knee wasn’t the issue this time; it was my hip. 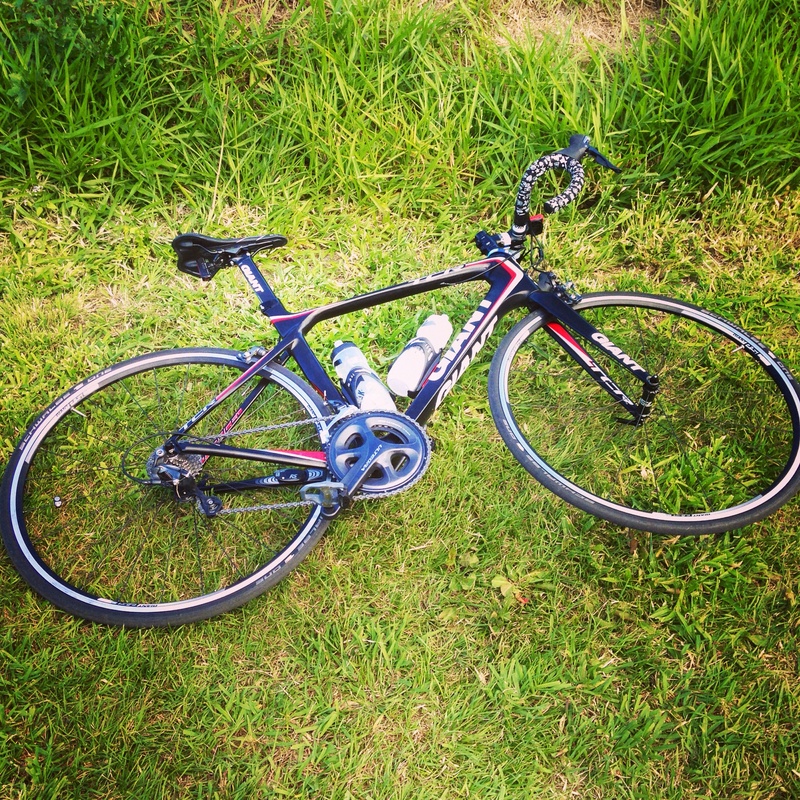 I had ridden past being uncomfortable and was now experiencing some fairly acute pain in my hip and glutes. I made the hard decision to stop riding and once again jump inside the SAG wagon with Matt. I watched the other guys ride from inside the van as Matt drove the van and took photos. I was quite disappointed in myself for not riding through the pain; but considering I’ve just spent a week of intense physio and rest I’m glad I didn’t injure myself any further. At the end of the weekend we were all tired (some sorer than others) but more determined for the Trois Etapes in August. Please support us we head towards this once in a lifetime opportunity to raise awareness and much needed funds for Soldier On.